As you know, we reported Google algorithm search ranking shifts this past Monday based on weekend chatter. That died down for a bit but overnight it spiked back up. The comments on that post have people complaining about new changes in the past 24-hours and the ongoing WebmasterWorld thread has new chatter. In addition, many of the automated tracking tools are flaring up again. 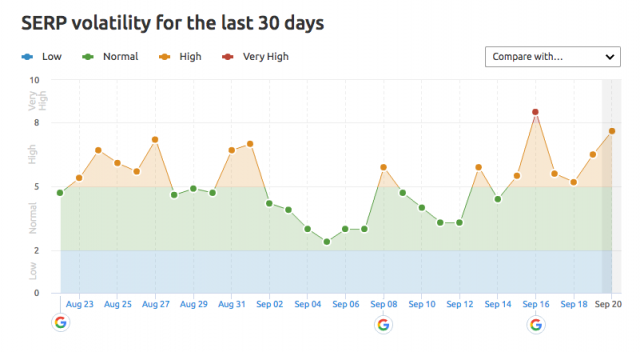 My site has lost about 30 to 40% of its google traffic today. Yes on weirdness. I see some sort of rollback. A page in cache is newer than the page being displayed in search results. Seeing a lot of movement. Wonder if it's related to the update/pullback over the weekend. Could be in for a big one overnight into tomorrow. It seems to be not as widespread as a big update but those impacted by this update is 100% feeling it big time.